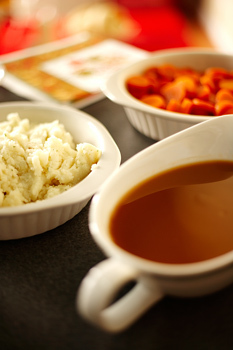 Making good gravy is easy, especially when you have a good gravy mix. You don't need to buy gravy powder - you have everything you need right in your kitchen to make the best instant gravy powder around. As with all things MOO the advantage is you control what goes into it. When you are looking for a stock powder, read the ingredients and buy one without MSG. I use Massel stock powders, they cost a little more but are 99% fat free without MSG and are suitable for vegetarians and vegans. They are truly concentrated which means you use less to get the same flavour. To make gravy, whisk 1/4 cup of gravy mix with 1 cup of boiling water (or vegetable stock or pan juices or milk) in a large heat-proof jug until there are no lumps and the gravy has thickened. If the gravy is too thick add a little more boiling water, whisking well. Combine all ingredients and store an airtight container. To make chicken gravy melt 2 tablespoons of butter in a small sauce pan. Whisk 1/2 cup gravy mix into 1 cup of water (or milk if you want a rich gravy) until there are no lumps. Add to the saucepan and whisk the butter into the gravy mixture. Bring to a boil, turn heat down and simmer 1 minute until the gravy thickens, stirring constantly. Add more liquid for a thinner gravy. These recipes make the equivalent of four packets of flavoured gravy mix.